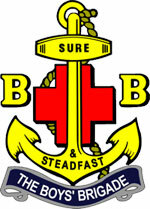 An anchor placed over a Greek Cross with the motto "Sure and Steadfast". Both the symbol and motto come from Hebrews, Chapter 6, Verse 19: 'Which hope we have as an anchor of the soul, both sure and steadfast'. A traditional hymn in the BB is "Will Your Anchor Hold" by Priscilla Jane Owens (set to music by William James Kirkpatrick). Grounded firm and deep in the Saviours love. Shall the angry waves then your bark o'erflow?.